Leoxsys LB4 Bluetooth 4.0 Dongle is the ideal accessory to give your PC or laptop Bluetooth capability. 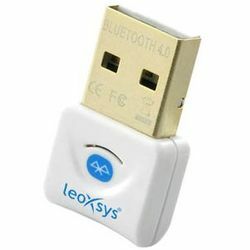 Leoxsys LB4 Bluetooth low energy wireless USB adapter is a plug and play device used to add Bluetooth capability to your computer. When plugged in, the micro dongle quickly installs itself and you have Bluetooth capability, it's as simple as that. This dongle supports dual-mode Bluetooth transmission just by plugging into your computer’s USB slot. Also with a 3MB/s data rate for distances of up to 15-20 meters this Bluetooth dongle can be used in different environments for work, in the office and at home. The Leoxsys LB4 has a low profile and rounded edges so leaving it plugged in full time will not be an issue. People wanting to backup data easily from their mobile devices will find this dongle useful. The dongle is compatible with many windows operating systems such as windows 7, Windows 8, Windows Vista and Windows XP. Leoxsys LB4 Bluetooth 4.0 Dongle is the ideal accessory to give your PC or laptop Bluetooth capability. Leoxsys LB4 Bluetooth low energy wireless USB adapter is a plug and play device used to add Bluetooth capability to your computer. When plugged in, the micro dongle quickly installs itself and you have Bluetooth capability, it's as simple as that. This dongle supports dual-mode Bluetooth transmission just by plugging into your computer’s USB slot. Also with a 3MB/s data rate for distances of up to 15-20 meters this Bluetooth dongle can be used in different environments for work, in the office and at home. The Leoxsys LB4 has a low profile and rounded edges so leaving it plugged in full time will not be an issue. People wanting to backup data easily from their mobile devices will find this dongle useful. The dongle is compatible with many windows operating systems such as windows 7, Windows 8, Windows Vista and Windows XP.